Windows Vista has drawn a lot of criticism for running more slowly than Windows XP did on comparable hardware. As such, one of the goals that Microsoft set for themselves when creating Windows 7 was to make it perform better than Vista did. This doesn’t mean that there isn’t room for improvement though. In this article, I will show you some things that you can do to squeeze even better performance out of Windows 7. By itself, Internet Explorer is a fairly efficient application. However, add-ons can really decrease the browser’s performance. Windows 7 actually allows you to see which add-ons are taking the longest to load. From there, you can make a decision as to whether or not you want to disable the add-on in the name of faster load times. 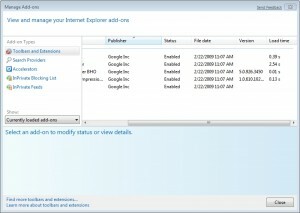 You can check the performance of each add-on by opening Internet Explorer, and selecting the Manage Add-Ons command from the Tools menu. When the list of add-ons appears, scroll all the way to the right, and you will see a column that tells you how long each add-on takes to load, as shown in Figure A.
Internet Explorer shows you how long it took to load each add-on. MSConfig has been around in one form or another since the days of Windows 3.1, and is alive and well in Windows 7. Although MSConfig was originally intended as a tool for diagnosing boot problems, it can also be used as a tool for optimizing the system’s performance. You can launch MSConfig by entering the MSCONFIG command at the Run prompt. When the System Configuration dialog box opens, go to the Startup tab. As you can see in Figure B, this tab shows you which programs are set to run when the system boots, and allows you to disable any unwanted startup items. 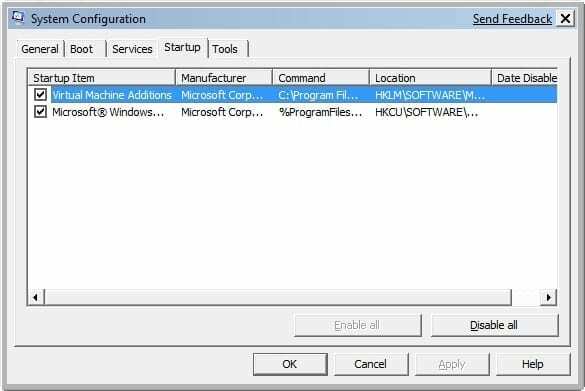 The System Configuration tool allows you to disable unwanted startup items. The performance impact of the Aero interface has been hotly debated since the time that Windows Vista was first released. I have seen some benchmark tests that indicate that there is no noticeable performance impact associated with enabling the Aero interface. At the same time though, there are people who swear that their PCs run more efficiently without it. In either case though, there is no denying that Aero does consume a significant amount of system resources. In the current beta of Windows 7, Setup is designed to compute the system index. Assuming that the machine has a sufficient system index score and compatible graphics hardware, aero is automatically enabled. On the other hand, aero is not automatically enabled (although the aero shake and aero peek features are enabled) if you are running Windows 7 within a virtual machine. Windows 7 is designed so that it will not compute the system index if it is running within a virtual machine, and unless a system index is calculated, the aero glass is not enabled. Of course this raises the question of whether or not these effects impact the system’s performance. My personal take on the matter is that it all boils down to your system’s hardware. If you have a good quality graphics card with plenty of dedicated memory on it, then the effects probably aren’t going to have much of an impact (if any) on your system’s performance. On the other hand, if your computer doesn’t have a processor that is dedicated to rendering graphics, then the various visual effects would probably have at least some impact on how the system performs. If you are concerned about the performance impact of Windows Aero, you can disable it with relative ease. To do so, right click on an empty part of the desktop, and then choose the Personalize command from the shortcut menu. When the Personalization window appears, click the Windows Color icon. This will cause Windows to display the Windows Color and Appearance dialog box. Click the Open Classic Properties for More Color Options link, and Windows will open the Appearance Settings dialog box. This dialog box allows you to choose between various color schemes. Choose the Windows Vista Basic scheme, and click OK. Aero should now be disabled. Windows 7 is still in beta, so it is a good bet that Microsoft will make us aware of even more performance tweaks as we get closer to the RTM build. Until then, these are some techniques that you can use to make Windows 7 run more efficiently.